A number of websites attempted to capitalize on the user-generated content craze of the late 2000s, but for games instead of text, images, or video. In 2008, Electronic Arts’ Sims division released their go at a community site where users can upload and play games, Sims Carnival. Unlike some of its competitors, Sims Carnival offers three different ways to create games. They have an online “wizard” that generates a game from a few simple choices. Then they offer a downloadable Windows client called Game Creator, which affords more complex development via asset importing and simple visual programming. The site also allows users to upload Flash games they created on their own. Finally, users can “remix” games created with the first two methods by replacing their assets through simple web upload and republishing. Recently, EA invited me to create a game for the art category of the service in the hopes of showing different possible uses of their tools and service. The result is Honorarium. It is a game about the lecture circuit. You can play it over on the Sims Carnival site (or you could, anyway, until they shut it down). Since it’s an “art game,” I’d like to let the work speak for itself. I will say that it’s subtle, and autobiographical, and its themes include work, colleagues, family, distraction, longing, goals, and regret. I hope you’ll try it out. Even though I am able to write a game in Flash, I deliberately chose to embrace the Game Creator tool. Given my interest in platforms and their constraints, I wanted to see which affordances and limitations the Sims team had chosen to impose. Certain things are much simpler in Game Creator, such as creating animations and playing sounds. Others that would be simple in Flash are more unintuitive, requiring weird workarounds with the visual programming language (for example, moving to a specific frame of an animation based on a variable value). My Game Creator experience was enlightening, however, because it led me to new conclusions about sites like Sims Carnival. 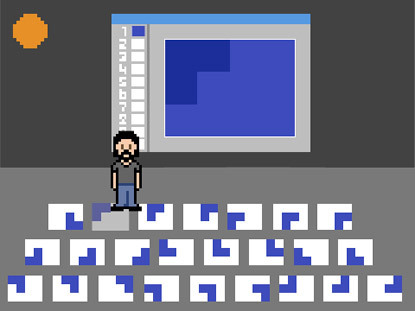 Much of the rhetoric surrounding these game creation and distribution sites relies on accessibility: they are supposed to make game development easy. But the truth is, simplified creation tools don’t necessarily make creativity easier or harder, they just impose different constraints. In certain ways, writing a haiku or shooting a three-minute film is easier than penning an epic or directing a feature. Likewise, in certain ways, using a Diana to take a photo or mixing Garage Band samples into a musical composition is easier than composing a view camera or conducting an orchestra. But in other ways, performing these apparently simpler creative acts is no less challenging; it’s just more constrained. As many of the games on the Sims Carnival service show, it’s relatively easy to create a simple game. But these games often serve a different purpose from ordinary casual games—they are not so much intended for amusement as they are for personal satisfaction or sharing with a few friends (for example, consider IM ,kissing JOe JOnas!). Nevertheless, it is possible to create a variety of different games using the basic tools provided, as my game hopefully demonstrates in part.